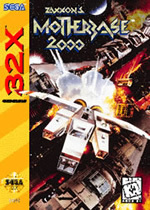 Zaxxon’s Motherbase 2000 is the successor to Sega’s classic but obscure 1982 arcade game Zaxxon, revived and enhanced on the 32X. Despite sharing the name Zaxxon, the only thing both games have in common is that they’re space shooters and they’re played from an isometric view instead of the common top-down or side-scrolling views that are usually used in the genre. Unlike its predecessor, however, which was entirely sprite-based, this updated version’s enemies and obstacles are now represented in three dimensions thanks to wonderfully flat-shaded polygons. Story-wise, you’re a pilot belonging to a group of rebels who have set out to destroy an evil faction called the Ginglii who are out to take over the universe and only you can stop them. That’s it; end of story. Considering that the story can only be found in the game’s manual and is nowhere to be found in the actual gameplay… let’s just forget about it. At first glance, Motherbase 2000 seems like an average cut-and-dry shooter. You fly around, you shoot things, and they die. However, all good shooters have a gimmick (such as the reflective shield in GigaWing or the different polarities in Ikaruga), and Motherbase 2000 certainly has an incredible gimmick of its own. In the original Zaxxon, the isometric view was used to control the height of your ship for various strategic reasons but in Motherbase 2000, your ship has the ability to literally jump up off of the field of play thanks to a rocket booster mounted on its belly. Sure, this can be used to move quicker and dodge fire, but that’s not the real reason it’s here. Certain allied ships can be found scattered around the level that will fight alongside you if you boost on top of them and take control, rendering your weak little one-hit-and-it’s-dead fighter into a more powerful war machine. What makes this ability even tastier is that it works with most of the enemy vessels in the game! The fun doesn’t end there, as every enemy you take control of has two unique weapons. After a few moments inside of an enemy ship, you’ll see a lightning effect and hear a voice sample say “ready,” letting you know that you’ve hacked that ship. What this means is when you’re forced to bail out or go down with the ship thanks to taking too much damage, your little base ship will still be able to use the secondary fire of the last craft you hacked into (your ship has no secondary fire by default). With such an intuitive and incredibly fun system, you’ll wonder why no one’s thought of doing this before and you’ll spend most of your time trying to capture new enemies just to see what they do. I particularly like the addition of the occasional friendly ships in this game as it gives you the feeling that you’re not fighting a one-man war but are one soldier in the grand scheme of things. Not all of the gameplay is as inspired as your ship’s hacking abilities, which is where the game starts taking an unfortunate turn for the worse. The isometric view used by several famous games like Diablo to make games that aren’t really 3D look like they are really makes maneuvering a bit difficult, as it’s hard to judge how close you are to obstacles. This can occasion make dodging very awkward, especially during boss encounters, which leads me to the next issue. The bosses themselves are large and menacing but every time the screen becomes too cluttered the frame-rate stutters, which results in cheap deaths. This is particularly true against bosses, which is exactly where you really don’t want slowdown to happen. Despite the controls being responsive, the ship seems to be sort of sluggish, but that might just be my personal taste conflicting with the game’s style. Motherbase 2000 offers you a lot of continues, and you’ll probably need them until you get used to navigating the trap filled levels that are usually more dangerous than the enemies themselves. The game’s graphics range from great to mediocre. With the extremely limited polygons that this game uses, Sega has managed to construct some interesting enemies, my favorite being the Veritech style robot fighters that appear in the second level (which you unfortunately can’t hack). The enormous bosses are also done well, considering what they had to work with. Your ship itself is also interesting looking and for some reason has a tail that sways back and forth as it flies (I’m guessing that’s what it uses to hack into enemy vessels). The 2D parts of the game, such as the levels which you scroll over, are incredibly repetitive and boring, but you’ll most likely be too busy paying attention to the gameplay. The weapon effects and explosions are also very grainy and mediocre. 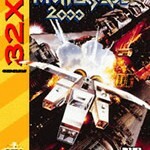 There’s no excuse for the 32X to not give me some decent explosions in my shooter game! Just look at Shadow Squadron for an example of how to do it right. Furthermore, some enemy bullets are so small that I found myself cursing at the screen and wondering what hit me several times, as the game dealt out some cheap deaths. The sound could have pumped a little more life into the title but for the most part it’s just bearable. While it doesn’t grate on you, the soundtrack attempts to be full of adrenaline but it’s fuzzy and repetitive, and you’re better off just playing your own music. The songs also have digitized voices thrown in like “Go… Go… Go…” which repeat throughout an entire track and eventually becomes a general annoyance. The sound effects don’t fare any better, as your weapons make a weak pinging sound and explosions are barely audible. The sound feels like it wants to come out of its shell, but it comes off more like it has serious self-esteem problems and would rather quietly hide in the background. I really, really wanted to like Motherbase 2000. The ship hacking gimmick is sublime, and the game gets by as a fun shooter on that feature alone. It’s by no means a bad title but the frame rate issues, the cheap deaths, and the generic monotony that the rest of the game contains makes it average at best, which is a shame because I would have loved to see the hacking gimmick put to better use. Like most 32X games the title is kind of rare and, I’d really only recommend it to fans or collectors of the shmup genre since there’s so many better titles on the genesis like M.U.S.H.A. and the Thunder Force series that get the same job done with sprites. Once you beat Motherbase 2000, there’s really no reason to want to come back to it like there is with other shooters, unless you count wanting to see what all the enemy ships can do. Unsurprisingly, after this outing on the 32X, Zaxxon returned to the crowded pages of obscure Sega franchises that are never to be seen or heard from again. Motherbase 2000 does offer and on-board control setting that allows the ship to be controlled more like Zaxxon and less like Viewpoint. I tried it and it didn’t work well enough for me, but it is an option.